IN PROGRESS -- As expected, Palm has announced a Treo smartphone on Windows Mobile. Top brass from Palm, Microsoft (including Bill Gates) and Verizon Wireless gathered in San Fransisco this morning to launch the device. Palm noted that this project has been in the works for, "a couple of years" and that it was one of the worst kept secrets in the industry. The Treo smartphone on Windows Mobile is expected to begin shipping from Verizon Wireless early in Q1 2006. It will be available through Verizon Wireless exclusively. No specific word yet on a GSM version, but Palm says there are no plans earlier than the second-half of 2006. NOTE: Palm has not actually announced a product name beyond the phrase, "Treo smartphone on Windows Mobile." 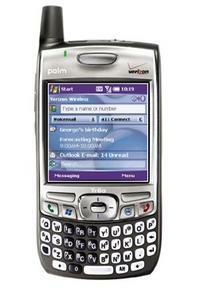 Rumors indicated this phone will be called the Palm Treo 700w. During the Q&A session Palm noted that a product name has not been announced.